The ESE-RT industrial rectifiers ensure the DC power continuity in the most demanding industrial environment, where it is necessary to provide the maximum reliability. Single branch rectifiers : one rectifier conversion unit with one battery. Double branch rectifiers : a system composed by two rectifier conversion units with one battery. Rectifiers in parallel : two rectifiers, each one with his battery. Single branch rectifier: is our basic, inexpensive and reliable product, both for single phase and three-phase mains. Like to the other rectifier typologies, also the single branch rectifiers can be customized complying the specific characteristics of each plant. Double branch rectifier: is a DC system that avoids load stops caused by unexpected malfunctions of the system. This rectifier is composed by two AC/DC conversion units which operate independently when mains is present (normal operation). The BB (Battery Branch) rectifier charges the batteries, independently from the loads which are supplied only by the SB (Services Branch) rectifier. In case of power black-out, the battery will provide immediately power to the loads. In case of SB rectifier failure (on SB line), the BB rectifier will automatically supply both the load and the battery, maintaining the emergency voltage limit settable at ±10%. On the contrary, in case of BB rectifier failure, the SB rectifier will automatically supply both the battery and the load, maintaining the emergency voltage limit settable at ±10%. Then, when mains come back, each rectifier returns to its independent function. As showed in the figure, the two conversion units are independent. When battery starts for power losses an intermediate connection on battery avoids voltage interruption, during the contactor lock. The double branch configuration is also available in Power Boost Mode. This means that in presence of overload on the SB line, the BB line automatically puts itself in parallel with the RS line, as long as the overload lasts. During this time the output voltage of the system will be equal to the floating charge value, whereas the batteries will always be maintained in charge. Rectifiers in parallel: this is another solution that always assures the loads’ feeding in case of a rectifier failure. A second rectifier is in function for this purpose. This solution requests two batteries, each one dedicated to a single rectifier. Some of these typologies characterize also the “PLATINUM” version, where our technology works with the advanced communication solutions. In PLATINUM version all alarms, measures and status information are reported on a color HMI panel. TCP/IP interface and MODBUS protocol for connection with WEB server and other centralized control systems are provided. On demand Elettro supplies a WEB-Server software, for an easy control of PLATINUM rectifiers on your net or via the most common browsers. distribution boards, digital instruments, drop cells, temperature compensation on batteries during the charge, protections against deep battery discharge, batteries test, space heaters, air filters, remote control panels, emergency power off (EPO), special IP and RAL. Compact and removable rectifier modules: in case of malfunctions modules can be easily replaced. 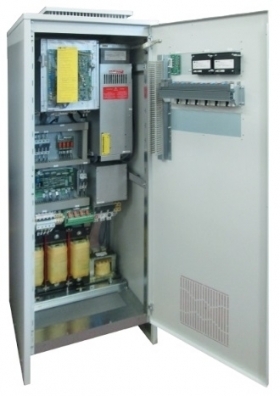 ESE – RT Rectifiers is the right product to grant the DC power continuity inside industrial plants. Each rectifier is built following the customer’s requests and customer’s technical specifications. Moreover it is designed to work with any kind of battery. If required Elettro can co-operate with you to define the best technical solution, including the choice of the right battery, indicating the commissioning operations for each installation and being willing for eventual training. Elettro is at your disposal to provide you with detailed offers, attaching the one-wire diagrams, the list of measures, states and alarms, the electrical and mechanical data of the proposed equipment.